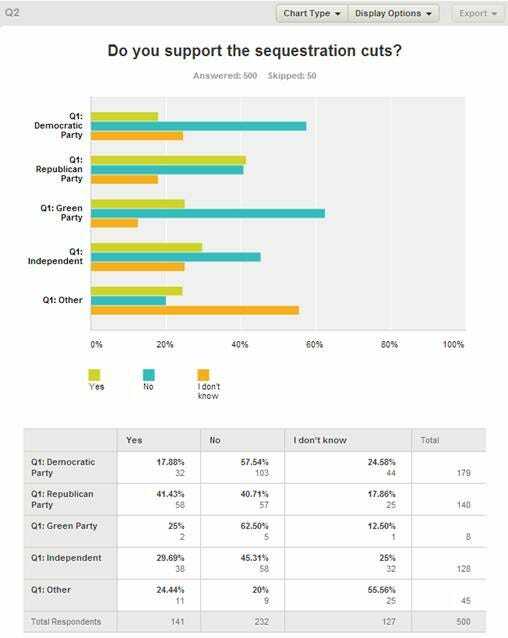 Most Republicans don’t actually support the House Republican plan to avert the spending cuts known as the sequester, according to a new poll conducted for Business Insider by our partner SurveyMonkey. 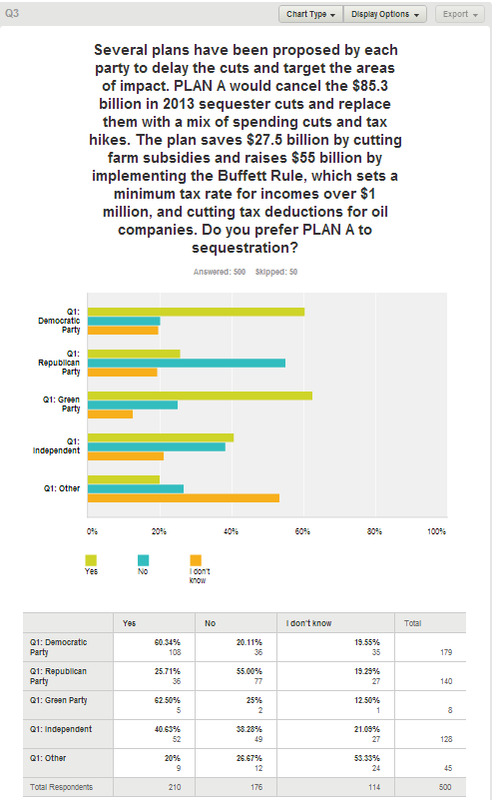 The poll asked participants to consider the core points of three sequester replacement proposals in Congress, without telling them the partisan affiliation of those plans. 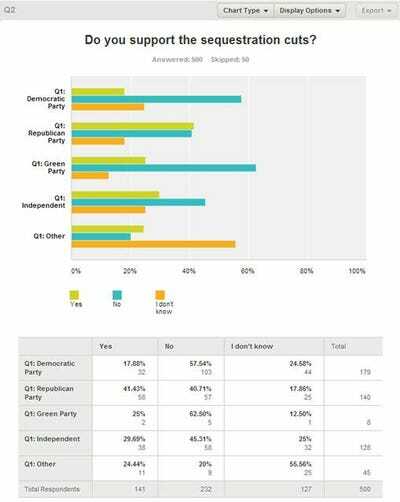 It found that in some cases, both Democrats and Republicans actually opposed their own party’s plans and/or backed their adversaries’ proposal. The 2012 House Republican plan would cancel the $55 billion in sequester defence cuts for 2013 and replace them by shrinking funding to food stamp programs, cutting $11.4 billion from the public health fund in the Affordable Care Act, and cutting the Social Services Block Grant program, among others. The House Progressive Caucus plan replaces the entire sequester with a new plan with equivalent savings. It accomplishes this by ending subsidies to fossil fuel companies, closing several tax loopholes, cutting the corporate meal and entertainment tax deduction at 25 per cent, and enacting a 28 per cent limit on certain tax deductions and extensions. 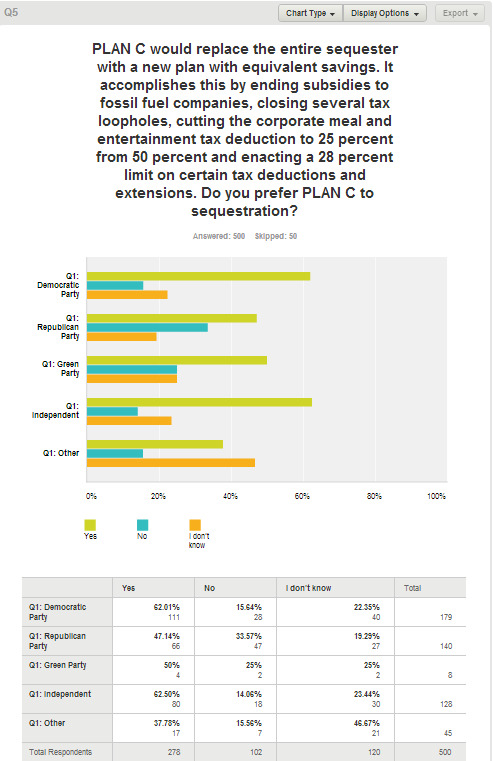 A plurality of people — 28 per cent — believed the House Progressive Caucus Plan would have the least financial impact on them personally. This makes the most sense, as only 14 per cent of respondents reported having income over $150,000. 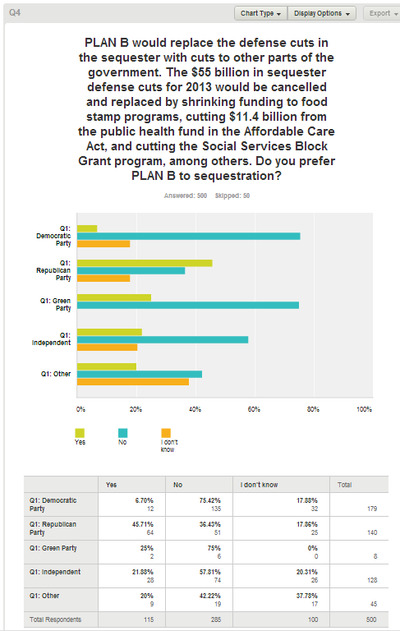 Shockingly, 47 per cent of Republicans preferred the House Progressive plan to the sequester. This means that Republicans supported the House Progressive plan just as much as they supported their own party’s plan. Opposition to the House Republican plan was strong, with 57 per cent preferring the sequester to that plan. One-fifth of Democrats prefer the sequester when compared to the Senate Democrats’ sequestration replacement plan. About one-quarter of Republicans prefer the Senate Democrat plan to the implementation of the sequester.